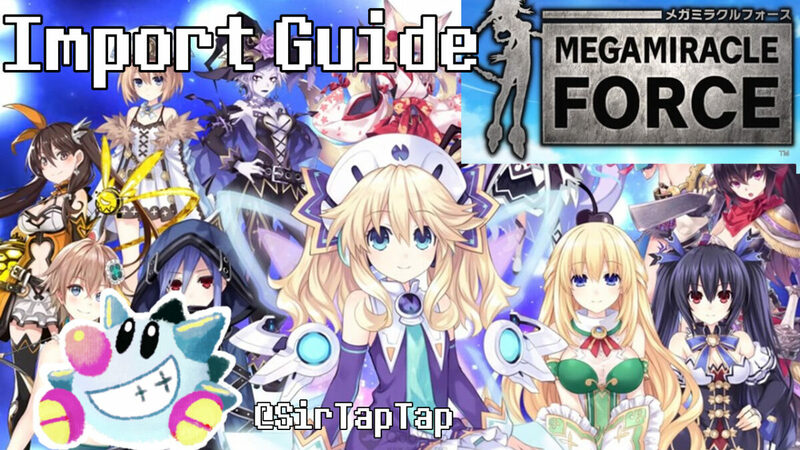 Sir TapTap » Guides » Neptunia » Mega Miracle Force (メガミラ) Import Guide | A Real Neptunia Crossover Mobile Game! For Android users Mega Miracle Force can be found on Qooapp and simply installed via their app on any region. If you already have Qooapp installed that link lets you download it or simply google Mega Miracle Force. For iOS I’m less sure, but I believe you can change your Apple ID’s region then simply open the app store (search メガミラ if you can’t find it). For now we’re puttying pretty much everything in this editable spreadsheet due to ease of sharing. Not by me, but there’s partial story translations here. A story of adventure, walking with you. A vast world were numerous races exist. You are the protagonist who fell to the outskirts of Planeptune like a meteor, crashed and buried into the ground. When you came to, there were two girls named Neptune and Noire standing before you. The truth lost in memories. The guardian goddesses unable to transform into their goddess forms. And the battle of what caused it that awaits. A new journey of adventure where various thoughts intertwine, each seeking the future that they desire, is about to begin. A dream crossover of Compile Heart’s previously released titles. 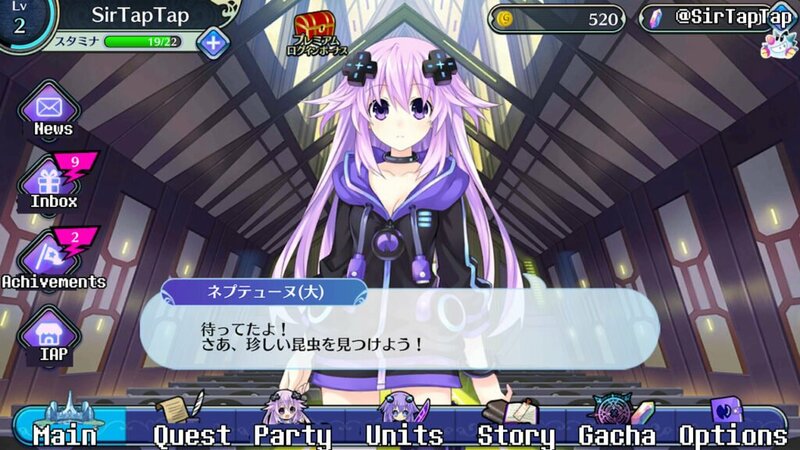 Characters will appear in massive numbers from the popular Neptunia series and more. Units will move beautifully on the map and fight. Simple, but deep! A tactical simulation RPG. – Fight on a five-by-seven map while utilizing various attack types such as close range, long range, piercing attacks, knock-backs, and more. Each character has a “speed” stat that determines the order which they take action. Equip “Link Cards” with Illustrations from Each Title – The protagonist has a mysterious power that materializes memories in the form of “Link Cards.” Equip these cards to increase your stats and activate special effects and abilities. A Rich Scenario Set in the Hyperdimension – The scenario follows an original story set in the Hyperdimension. Characters that appeared in Compile Heart games will cross over in this new journey of adventure. Episodes focused on each character will also be added to the game via updates. 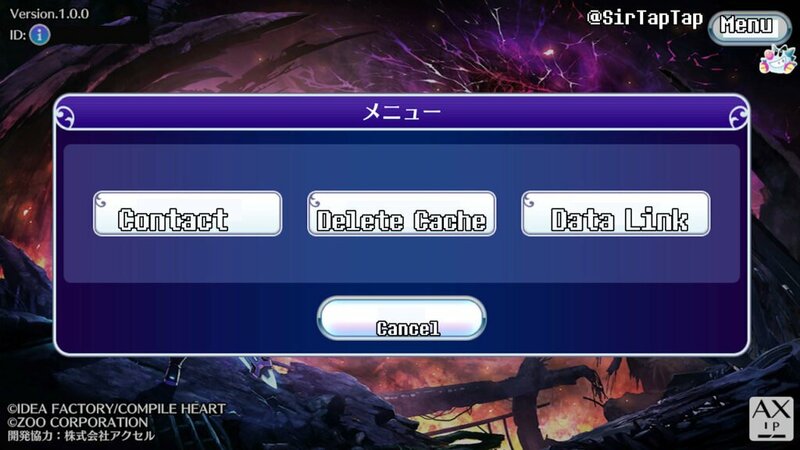 Note “Delete cache” just redownloads the data files, it doesn’t erase your save file. To delete your save, delete the app itself, or clear app data (android) without deleting the app itself. Just getting started on these, but this will get you into the actual game. Tap to select your player avatar then tap okay. You can change this at any time. Gender is an illusion. Enter your name; up to 16 characters, cannot be changed later. However, if you need to re-roll, names can be reused. After this Mega Miracle Force will download the intro and tutorial (I won’t translate the story due to effort required and low quality of google translation for such things, but if anyone has even the gist of the story, feel free to let me know!). The tutorial is unfailable so just keep going with it, you can only tap where it lets you tap for a while. You’ll get one free 2★ character at random now. Don’t reroll just yet, you’ll get two 11 pulls worth of currency soon, but it’s nice if your first free unit is good obviously. Once you clear the third tutorial battle you’re finally off the training wheels, get your first Daily Login rewards, and you can roll for Gachapon. This is the reroll point if you intend to do so. You’ll have enough currency for two 11 rolls and a few extras with just the starting items; check the Giftbox icon for your bonuses. Unlocked by beating Story Chapters (I think), Command Seals can be equipped to your party formations and let you activate a temporary boost in battle. They recharge after a few turns, so use them wisely but often. The Auto Battle will never use Command Seals. CGs or as the game calls them “Link Cards”, are the equipment of the game. Each link card buffs the 3 main stats (HP, Atk, Def) and includes a single passive skill, making them a critical aspect of a character’s build. You can equip CGs to characters from either the Party Menu or the Character Menu. You can Lock Link Cards from the Link Card submenu (second tab) of the Party Menu, this keeps you from accidentally saving/tossing them. 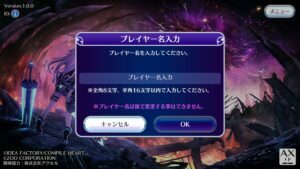 You can enhance CGs from the Characters/Gear menu (Purple Heart’s icon), higher rarity CGs, the “ring” CGs from Trillion God of Destruction, and duplicates of the base CG add extra experience. You can only carry so many CGs, so enhance the ones you use the most frequently. If you hit your cap, extra CGs will be stored in the main screen’s Giftbox icon for later retrieval. Unknown if there is a max for this, but if there is it’s over 100. You can also just sell CGs, but you really should just use them for experience, as it’s the only way to get it and you’re not likely to quickly max out experience. 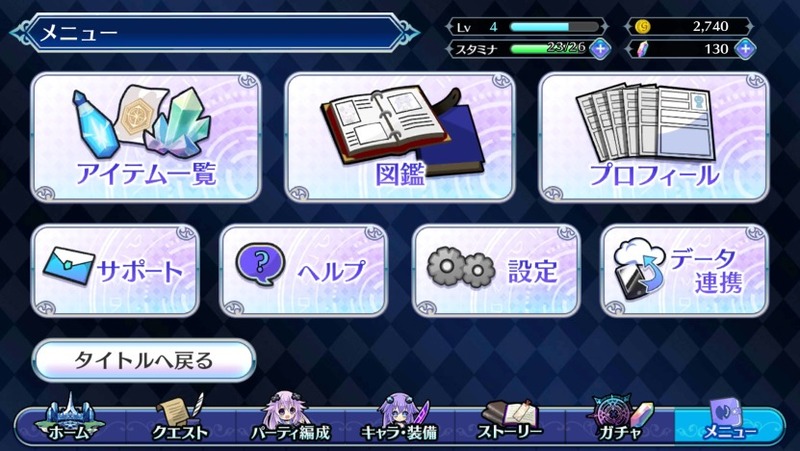 The first option on the Quest screen (Adult Neptune and Uzume) and main, active method of playing the game, Quests are where you play manually (or on auto) in a mini-SRPG style tactical grid. 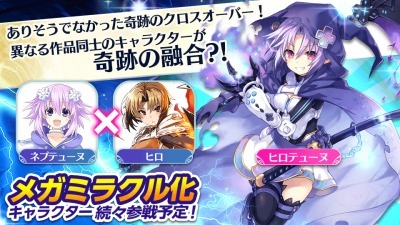 The second option with the Moero Chronicles Blonde, Daily Missions are a set of increasingly difficult battles focused on grinding a specific item. I haven’t translated the drops/order of these yet. See translations for more achievements are on the spreadsheet, we’re missing some so feel free to add! The third option on the Quest screen with Natsume Kannuki (redhead), this is where you send out a party for 30+ minutes and they come back with free XP and items. As far as I can tell Exploration cannot be failed, so use it to level up lower level characters. You unlock more party slots as your player character levels up; wait until you have at least 2 parties before sending someone off, or you won’t be able to fight actively. Note you might have to set your device to Tokyo time in order for Explorations to not glitch out with extremely long times. You can use an instant-complete coupon (various achievements give these) if you get stuck in this state. Once in a while after clearing a combat stage, you’ll get notified of an Emergency Exploration (you’ll be shown 3 Shards icons and a confirm/cancel box). These explorations are once only (but they respawn as you play) and give you some shards of random characters. Not sure if there’s a pattern to who you get yet. They’re recommended you always go for them due to the rarity and value of shards. Help contribute to the character sheet here! Note the starting set of characters is pretty limited, for example Green Heart and Black Heart are unreleased, despite Noire and Vert being in the game. Note most art in the game (other than the chibis) isn’t new currently, it’s mostly the characters’ most recent art from their official games. Fusion characters however have brand new art (due to being new characters). We don’t currently know how OP any character/tier is, but it’s pretty safe to say the game is meant to be played with 2★ units rather than exclusively focusing on 3★s, of which there are barely any in the game. All units can upgrade to 5★, though gacha games usually give some nice bonuses to the rarest units of course. Tap the Heart icon on the Characters page to change who your Main Menu screen character is. Lily Rank is the meter under the character’s level experience gauge. It goes from one to 5 and raises base stats a bit each level. It raises HP by 100 per level and Atk/Def/Agi by 25 each level and has no other effects. Raise Lily Rank by bringing units to battle, setting them as your Favorite, and setting them as Leader within the party. 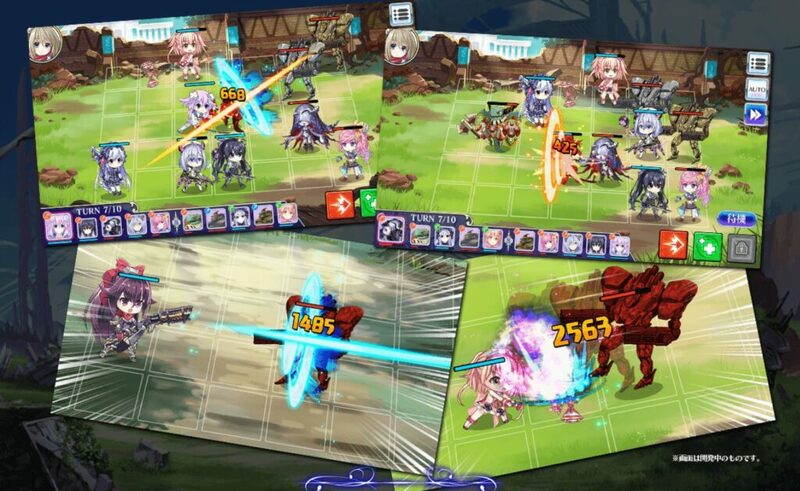 There are three unit types in the game which determine how characters’ basic attacks work, and also determine which experience crystals give the most experience. There does not appear to be elemental/rock-paper-scissors style damage scaling for class types. Note that a character’s actual stats and weapons actually matter more for how they act than their class, which is a pretty rough measure. A strategy for making the most of 1 move characters is to have an entire party of them and let the enemy team (hopefully) waste their turns trying to get close then using your range and/or tanky stats to better advantage. You can also just not move your 2-3 move characters for the first turn or two to let the enemies draw near. Sword users generally move 3 tiles and have a range of one tile, making them some of the most effective units as they can actually get around the battlefield. Sword movers are some of the most effective in the game, having no major downsides. Sword units are good back row units due to their high move. Axe/hammer/scythe users tend to only move 1 space, attack from 1 space away, and they knock back units 1 tile when hit. They unfortunately tend to be the worst units in the game as they’re rarely given anything worth the extreme range disadvantage. They’re generally pretty tanky, however, with good defense/HP. Presently the smallest group, gunners have only 1 move but a range of 1-2 spaces away from them including diagonally. Shooters should be placed in the front row, as they can still hit an enemy if they act first in front row, but will almost always waste a turn moving in the back row. Unlike Spears their shots do not pierce, hurting only the target selected. Their movement range hurts a bit, making them a bit less effective by default than Sorcerers, but they can attack immediately adjacent units. Sorcerers have 1 move and a range of 2-3 tiles away, including diagonally. They generally have ranged skills as well. Sorcerers are the only units not currently majorly hindered by having only 1 move since their range is pretty usable, though note they can’t attack immediately adjacent tiles. There’s two tabs in the Gachapon, one is the normal character roll, and one is a free set of items twice daily from Croire. Make sure to get your free stuff, there’s no reason not to roll it. You can get CGs, experience items and more. The gacha is pretty standard, has a bonus for doing a 10 pull (30 gems is 1 pull, 300 is 11), and there’s 3 rarity tiers in the pool, 1, 2, and 3 stars. Further stars can be added by enhancement. General rates are “Bad, but not FGO bad” with 2% odds for an SR and no Dragalia style “oops you got an item instead of a character, loser! Stupid IDIOT” mechanics. An 11 pull guarantees at least one 2★ unit (but with no change in 3★ rate). Individual units all share the same rate within a rarity tier; each individual 1★ has a 5.33% rate (repeating of course), 2★ has 1.5%, and 3★ has 0.2% at the moment. As units are added these rates will thin out a bit of course. Pulling a duplicate gives you fragments used to enhance another character’s star rating. The rewards are proportional to how rare the unit is, of course. Oddly there is currently no use for extra shards past 5*ing a character, which you still get. Costs for rank up are different for 1★ units (due to their abysmally low shard drop count). Rank ups do not increase in cost as you rise through the ranks. Second Link Card slot unlocked! Unlike any sane mobile game, the game oddly does not have a real cloud save. Instead it has a 72 hour “transfer code” that expires. You can set this up in the options menu to move devices, but it doesn’t really keep your data secure by itself. Hopefully this is changed soon. However, the account is linked on both devices, so what you can do is keep your account safe by keeping it logged in on a Nox emulator, a second phone etc, so even if you lose your main device you keep your Mega Miracle Force save. The actual save file is server-side, so this doesn’t allow any form of save-scumming, note. Then go to the phone/cloud icon. You’ll be asked to create and put in a 6 digit password. Put the same password in both fields, and remember your password and write down your player ID (it will be shown after you enter the password). Your account will still work on both devices, and you can log into either one (but not both at the same time). Your progress will be waiting on your other device whenever you log in. I recommend you keep your account active on at least two separate physical devices in case of theft/damage. The game isn’t the most reroll friendly as you’ll have to go through the tutorial each time. But the game only downloads about 150MB of data each time and the reinstall is quite quick. Note you can reuse your player name so you can reroll while keeping your preferred name, and you get some gacha currency off the bat, so it’s possible. You start with about two 11 rolls worth of free rolls due to the Pre-Registration campaign (you don’t have to do anything to get them, they’ll be in your gift inbox). I’d recommend shooting for a minimum of one 3 star character you really want. Anything more than that will probably require quite a few rerolls. If you want to use Nox player to reroll faster see the Emulator section below. That’s mostly up to you; you certainly do not need to reroll for 3 star units to beat the current content, 2 star units will do perfectly fine. 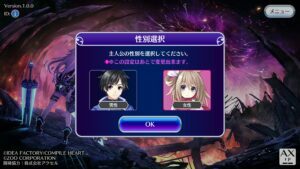 You’re also more or less guaranteed to get one or more of every two star (so, the Neptunia Human forms) with the free gems from the current story. Thus, rerolling only really matters if you prefer to get some of the rarest units or if there’s a specific character you really don’t want to start without. Try the specific android version first (most likely to matter) then the specific device in Nox’s Property Settings (easiest to change), then finally try the specific Nox version if you’re desperate (less likely to matter). To specify an Android version in Nox, you have to open Multi Drive (installed with Nox, look in the Star Menu) and click Add Emulator, then pick “New android 7.1.2 (Beta)” or the 5.1.1 option which also works. People trying to play MMF on Nox Player and other Android emulators come to a mostly consistent problem early in the tutorial. It seems like it can be avoided but only if you have a phone to play on too. What seems to be the issue is the CG switching menu, Nox crashes in most versions on it and we haven’t found a way to make that work. What you can do however is play the tutorial on phone, save your data, then load your save on emulator. You can play on Nox seemingly as much as you want, but you’ll have to swap CGs around on phone, annoying as that is. If you’re on emulator, see the above issue with older Android versions. Basically play on a more recent version of android. The game seems designed for Tokyo Time, and will work mostly normally, but the Exploration timers seem bugged. To fix this, play the game with your device on Tokyo’s timezone. Japanese wiki for the game.